The pricing for the 2014 Rheinland-Pfalz plandampf (now known, reasonably enough, as Dampfspektakel - which even I can translate) was more benevolent than last time. Possibly a mistake on the organisers' behalf, as it turned out, but it was a good excuse for us to go and renew our acquaintance with the big Pacifics and others. 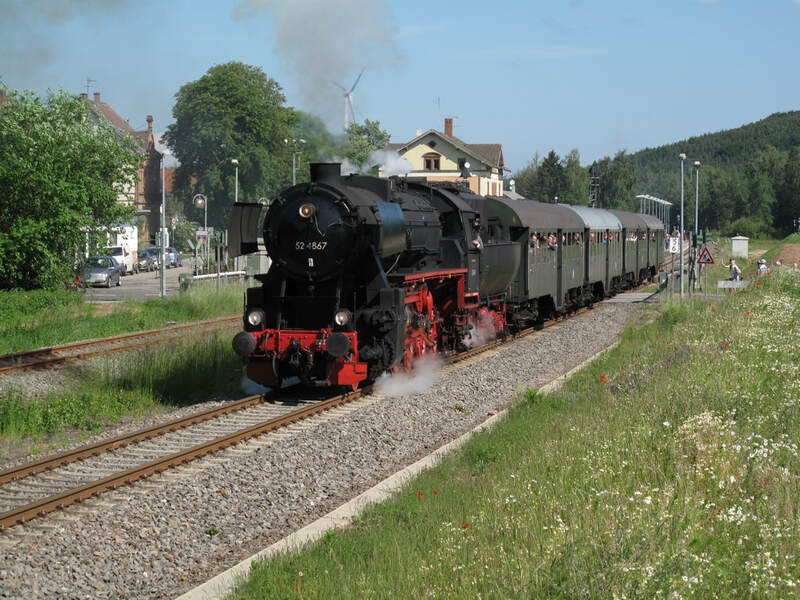 First railway outing of this year is to Germany for Dampfspektakel 2014, another plandampf in Rheinland-Pfalz, largely based on Neustadt (Weinstraße). Fares, flights, and hotel reception times made it tricky to get there in one day so the outward journey featured an overnight stop in Kent. A mad rush to get ready after a busy weekend and a trip to Lancashire, but we made the 11:53 Telford-Birmingham Irrational, a 6-car 158 with Aber and Harlech (Cambrian coast still washed out) portions. This arrrived only a minute or so down but contrived to be around 8 down by Smethwick Galton Bridge where we decamped in favour of LM's 12:35 Whitlock's End. This got us to Moor Street in time for 12:55 Marylebone, ex W&S Mk3 stock shoved by a 67 which I forgot to note. It's always a pleasure to ride in this comfortable stock, on a fast service, which never fails to make me wonder why anyone would bother to pay more to go on the opposition's Bendyleanos. But what do I know. Anyway, straight over to Charing Cross this time, for a quick run down to Orpington on of South Eastern's karts. Up well before the sparrows, to get 07:08 to Victoria by way of a change (and because we were heading for Heathrow). It's not wildly exciting but seemed to work well with the cross platform interchange at Baron's Court. The net result was that we were at Heathrow ages early and even after going through security (belt police today) we had quite a wait for the Airbus to Frankfurt. Having taxied back from Mainz, or so it felt, collected our bag and waited over half an hour for our hire car (if they try harder, what are the rest like), we sallied forth on to the autobahn to Enkenbach. The electronic idiot proved its worth again and we arrived at Hotel-Restaurant Kölbl without incident. Once checked in we drove the few miles to Kaiserslautern. I couldn't figure out the process for buying a VRN tageskarte from the ticket machine, and had it explained to me by the DB Reisezentrum man who clearly - perhaps rightly - thought I was stupid. It's not that obvious though; you start by asking for a single ticket to somewhere a long way off and only then do tageskarte related options start appearing. That dealt with, we retired to the Brauhaus am Markt for pork steak and a huge mound of chips, accompanied by a very fine hefeweizen (and a daft photo of Mrs Eurogricer with a tableful of cheery locals and their 'biertower'). Late breakfast as it's Ascension Day, followed by a diesel kart to Kaiserslautern and electric S2 thence to Neustadt. 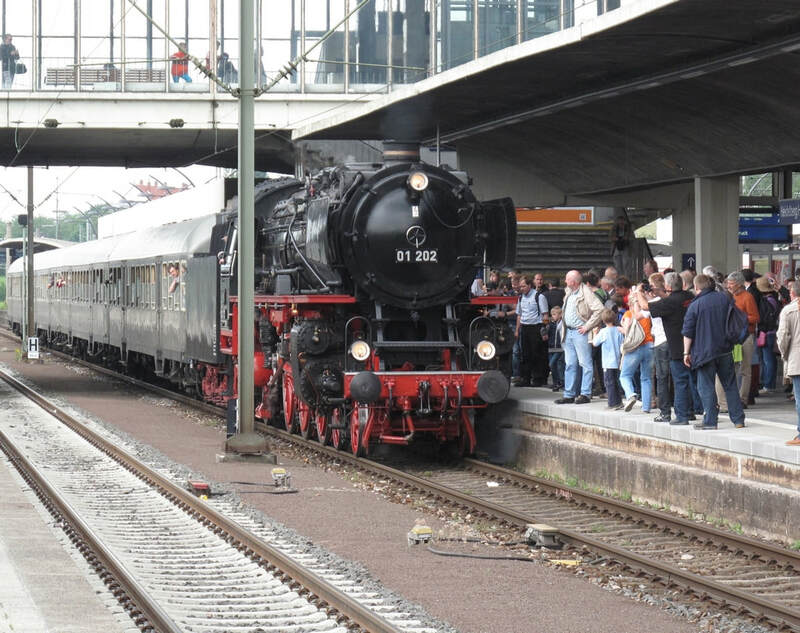 Crowds were gathering in anticipation of the 11:10 to Heilbronn. When it arrived, pushed in by train loco 01 202 deputising for failed 01 150, bedlam ensued. This was the worst behaviour I've encountered by far in Germany. Having managed to stop people crushing Mrs E.G and a young boy who was in danger of serious injury I eventually got on board assuming there would be no seats. Fortunately H had managed to find the last two aisle seats so virtue was rewarded. Needless to say the train left full and standing but with only 4 coaches a lively 01 202 had no trouble and got us to Heidelberg on time. We joined a very orderly and good natured lineup on the next island platform ready to phot 01 202 departing. What a pity that 101 140 rolled in to spoil the party... After a shot of sorts, the (hastily relocated) lineup dispersed, in our case to rush for an RB to Bensheim followed by another to Hofheim where we baled out to wait for 41 018, top and tail with 41 360. This was far less crowded and more civilised and we enjoyed the short run back to Bensheim. 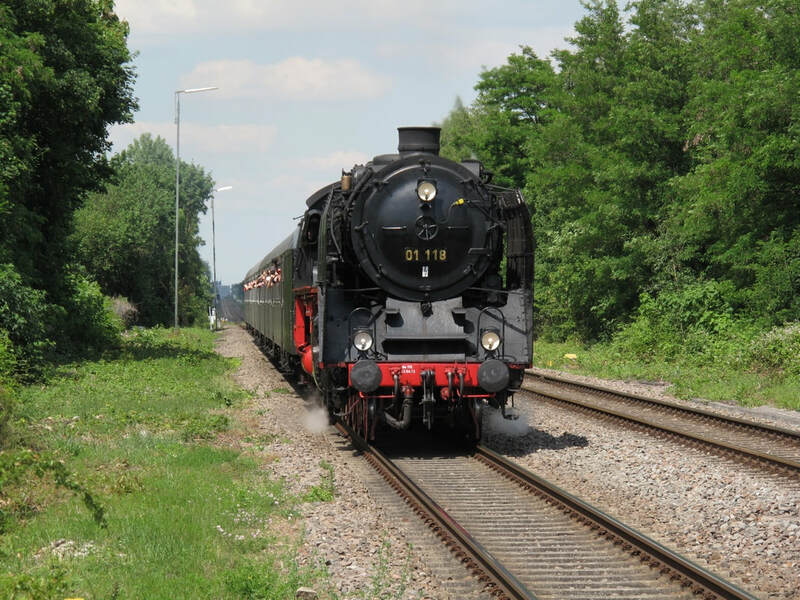 The next train was also steam hauled, by 01 118 tender first on the last Weinheim-Darrmstadt shuttle of the day. Full with a few standing but again we managed to find seats either side of the aisle without resorting to unseemly behaviour. 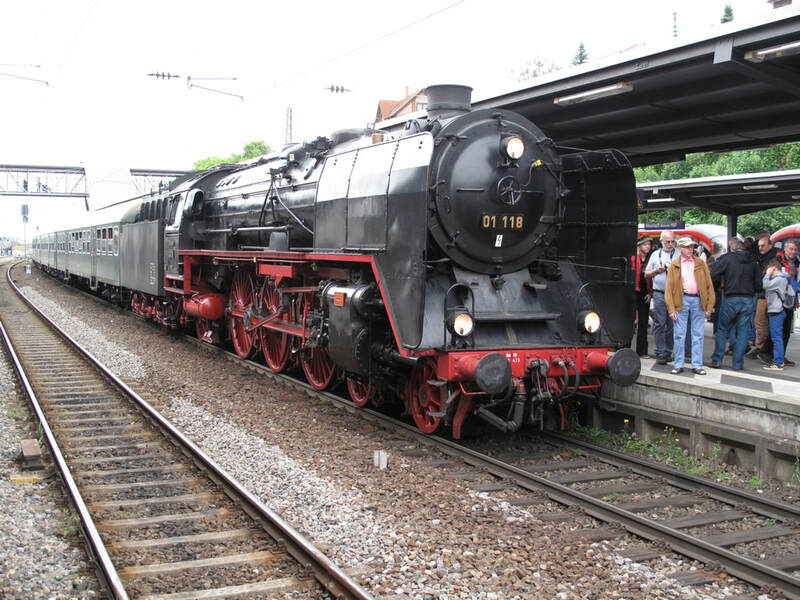 We thought it wise to stay on the train for the 14 minutes while 01 118 ran round at Darmstadt, and indeed it was! 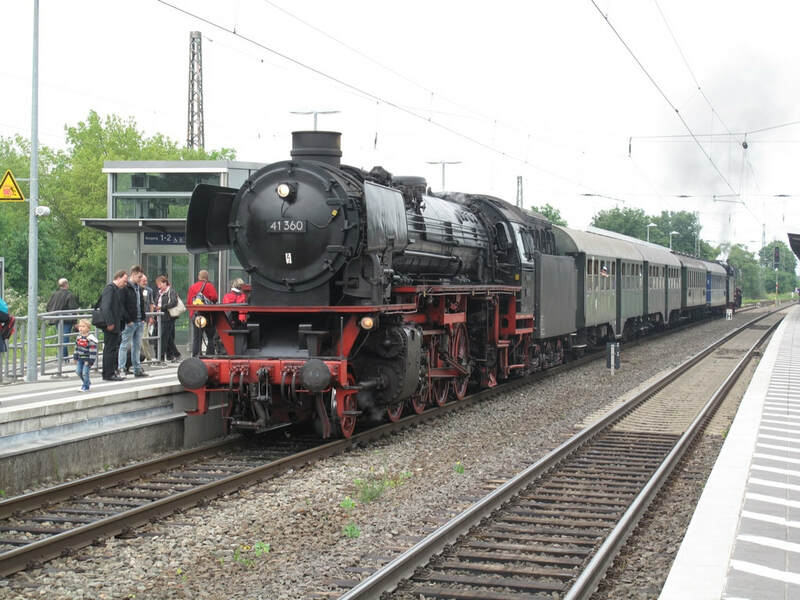 The run back to Neustadt was without incident with the light load trivial for 01 118. At Neustadt we decamped for a bus ride/walk to the beaver-themed Neustadter Brauhaus, a cunningly disguised steel-framed building which was pleasant enough. I had the hefeweizen again, OK but not as good as last night's. The pepper schnitzel and I were never going to get on. Back to Neustadt Hbf on foot as the bus connection was a bit tight, and then by S2 and RB via Kaiserslautern to Enkenbach. Only two steam train pairs out today so a little sightseeing was included.in the plan. Uncle Google had suggested a photo spot near Haßloch so we set out in the car via Neustadt and in the event encountered a likely spot a mile or two before the planned one. The usual international group assembled, in this case German, Austrian and British, and were rewarded with 01 202 on time and going like, er, a train. Onwards then to the Prinz Ludwig at Haßloch, a small street corner pub with the brewing kit tucked in behind the bar. I tried the helles (dunkel and weizen also on offer), before we made our way to Speyer for a look at the cathedral. This is a World Heritage site, almost a millennium old though as you'd expect, extensively modified, damaged, rebuilt, modified and renovated over the centuries with the latest project just about complete. A very fine building has resulted. 100 metres away from the cathedral there's a brewpub, Domhof. Well, it would have been rude not to pop in and try their very acceptable weizen. For the driver there was also green tea, something almost unheard of in UK pubs but surprisingly easy to come by in Germany. On the way back to the car we called in at a very interesting Protestant church with a two tier gallery and generally very ornate interior - a surprising contrast with the simple interior of the cathedral. The Mayer brewery tap in Oggenheim was the final call, for another robust meal accompanied by a very sound weizen and followed by a visit to the ice cream shop! Plans for further steam photographs were fading with the light and finally abandoned in favour of a more direct motorway route back to Enkenbach. Back on the trains today, after photting the 8:02 northbound at Enkenbach (52 7596 tender first) and having breakfast before more phots of the 10:02 and 10:03 (52 4867 tender first northbound and 7596 chimney first southbound). We moved on by RB and S2 to Weidenthal, where the international group was German, Irish and British and reasonable phots were obtained of 01 202 preceded by a couple of freights. Thence by S2 and RB to Bad Dürkheim for a long overdue grice of the metre gauge OEG interurban to Mannheim on one of their nice modern air-conditioned trams. Pausing only to obtain supplies of food and Früh's Kölsch we continued to Neustadt and thence to Edenkoben on an RB. After a photo of 01 118 passing through on the Neustadt-Karlsruhe working, we retired to Jäger Bräu which turned out, after a few navigational errors, to be across the road! Not the most pubby of pubs by any stretch of the imagination but the weizen, though not particularly to my taste, seemed to have continued its improvement since its ratebeer.com reviews and I found nothing to dislike about it. That said, I probably won’t be rushing back. Suitably refreshed we had a trip down to Landau with 52 8134, returning on a DMU to Neustadt and thence on an S2 to Kaiserslautern for a second visit to the Brauhaus am Markt. The bells which rang from 18:00 to 18:10 were spectacularly loud, but didn’t affect the excellent beer and food! 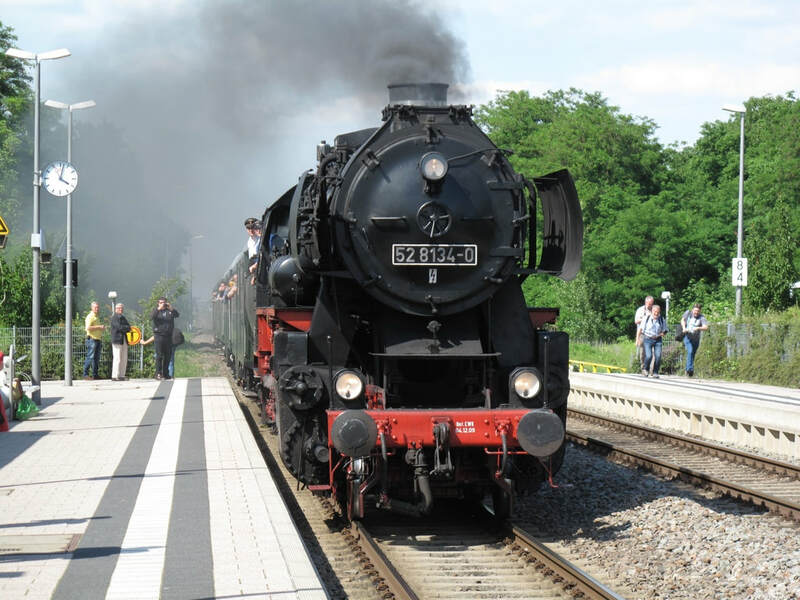 The last full day of the trip, this time assigned to the preserved Ostertalbahn which runs on occasional Sundays from Ottweiler to Schwarzerden. The line used to continue through to Kusel but is now a dead end branch. The trusty Fiesta took us to Ottweiler, a journey which was mostly motorway and took a lot less time than expected. Avis had supplied us with an automatic instead of manual transmission but at least it saved me from continually trying to change gear with the wrong hand! We had time to view the startup of the Altstadfest which was heavily beer-related as such things tend to be, though not well patronized at 10:30 on a Sunday. 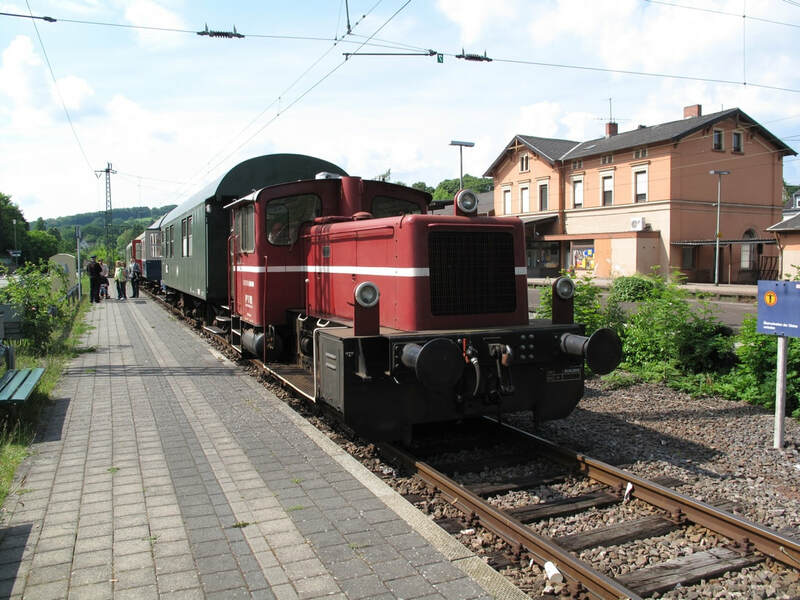 The Ostertalbahn train, powered by a 1963-built O&K LG III diesel shunter, works no. 26336, was scarcely better patronized although it acquired more passengers along the way. A very friendly crew were manning the buffet car which was, unfortunately although fortunately from a driving perspective, dispensing Bitburger. Your correspondent stayed with the orangeade and Mrs E.G was able to have her green tea, which pleased her greatly. 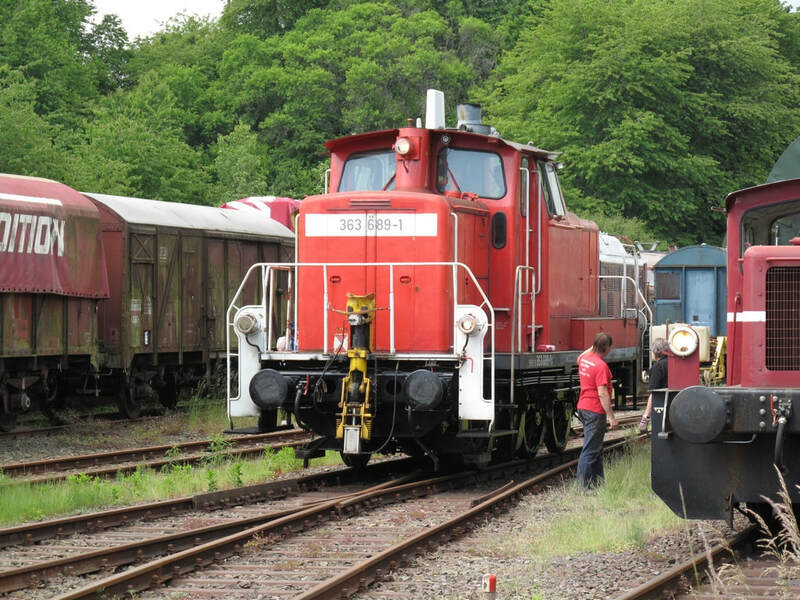 A considerable collection of diesels in varying stages of restoration was noted at Schwarzerden, including a couple of 217s. 363 689 was powered up and ran up and down the loop though we weren’t quite able to figure out why other than to get out of the way so that the train loco could run round. The timetable provides an 80 minute layover at Schwarzerden on this particular service which provided us easily enough time to find out there was nothing to do! Back at Ottweiler the Altstadtfest was in full swing and we managed to catch the last two numbers by the wholly admirable Saarland Polizei Big Band ['New York, New York' in particular was great and I can't see 'Ottweiler, Ottweiler' having quite the same ring to it] as well as a couple by another more pop-y band on the second stage round the corner. With driving imminent we again stayed off the beer and contented ourselves with an ice cream. We’d finished the railway activities by now so we set off on another motorway bash to Rüsselsheim where we were able to occupy the last remaining parking space behind the Hotel Arona Atrium in the centre of town. Suffice it to say that the aircraft fly very low overhead on their way into FRA, it’s gets very warm in the hotel, and it’s another one which despite the helpfulness of the staff, I won’t be rushing back to. It is however very handy for the no. 52 bus which dropped us off within 200 metres or so of the Kleines Rüsselsheimer Brauhaus which is on a small square, presumably once the centre of a village but now marooned among housing estates. It’s a nice spot though, with friendly staff, good food and a weizen (again) easily good enough to persuade me to have a second! The same cheery driver took us back on the 52 and we confidently expect to see him competing in the World Rally Championship at some future time. Well, it had all gone pretty smoothly so far. The hotel’s breakfast being €24 for the two of us we thought a baker’s shop would do just as well, and so it proved, at a princely €3 or so for a roll and coffee. The electronic idiot took us smoothly to the petrol station next to Terminal 2 so that we could fill the car up with petrol before returning it to Avis, and we were in the terminal with almost 2 hours before departure time. By the time we’d done all the airport stuff, including having my rucksack emptied out and searched because I’d forgotten there was an e-reader in it, and found our way to the gate we only waited about 5 minutes before being summoned to the bus to be taken out to BA’s 767. There followed a fairly long fester while a couple more bus loads were brought across and we eventually left a few minutes late, using the north-south runway so having quite a long taxi and setting off in the wrong direction. At this point the journey started to unravel. First the cap’n came on to say Heathrow ATC were going to stack us for 10 minutes. That didn’t happen in the end but when we arrived at T5 only a few minutes late, our allocated stand was occupied by a 747. We’d have to wait while the 747 finished loading, said the cap’n, it’d be ten minutes or so. Ten minutes later it was still loading and it would be another ten minutes. By this time it was apparent that the 747 couldn’t go anywhere until our aircraft was moved and sure enough we eventually set off forwards to do a 180 degree turn in ‘balloon loop’ style so that the 747 could be pushed back off the stand and we could take its place. Then we waited for the airbridge, then we got to Immigration. Just as we got to the front of the queue the electronic gates stopped working … just a couple of minutes, quoth Mr UK Visas and Immigration. It was somewhat longer but at least that allowed time for my bag to have (nearly) arrived at the carousel when I got there. It only took a few more minutes and about 70 minutes after touching down we made it to the Tube station. Trains only going to Northfields, said Mr London Underground cheerfully, there’s a power failure. Luckily I’d worked out a plan B beforehand in case Boris and the RMT were at odds again and we didn’t sigh too much as we made our way to the bus station for a 350 to West Drayton, the first point on FGW which is in Oysterland. A few minutes there and we were happily on our way to Paddington on a 2-car FGW DMU from Oxford. Well, apart from being all shacks to Ealing Broadway. From there it was only going to be a few more minutes … except the DMU sat down 1 mile 70 chains from Paddington for several minutes then the guard came on to say there was a signal failure and we were in a queue of trains waiting to get into Paddington. You couldn’t make it up. In the event only a few more minutes elapsed before we were on the move and Mrs E.G, who had a meeting near Covent Garden but had cannily told her colleague that she couldn’t get there until 14:00 despite our booked 11:30 arrival at LHR, was less than half an hour late! Meanwhile having parted company with her at Marylebone, I set off home on the 14:15 ex Marylebone which arrived at Moor Street on time so that I was able to hurtle across to New Street in time for the 16:05 Shrewsbury and with a very fortuitous series of bus connections, get home in Telford by 17:30. All in all an entertaining outing, although we could have done without the delays on the journey home. Dampfspektakel ran with the precision that had graced earlier events in Rheinland-Pfalz although there is surely a lesson to be learned that big Pacifics can handle more than 4-coach trains and that if the pricing is going to be as benevolent as it was this time, they’ll get more than 4 coaches of demand. But I’m not party to all the horrendous complexities of organising such a big event and it’s easy to criticise from a position of complete ignorance! It’s still miraculous that in 2014 such an event can even be dreamed of, let alone brought to fruition. One of the regular Internet posters on railway matters in Europe had a Significant Birthday in July 2014. 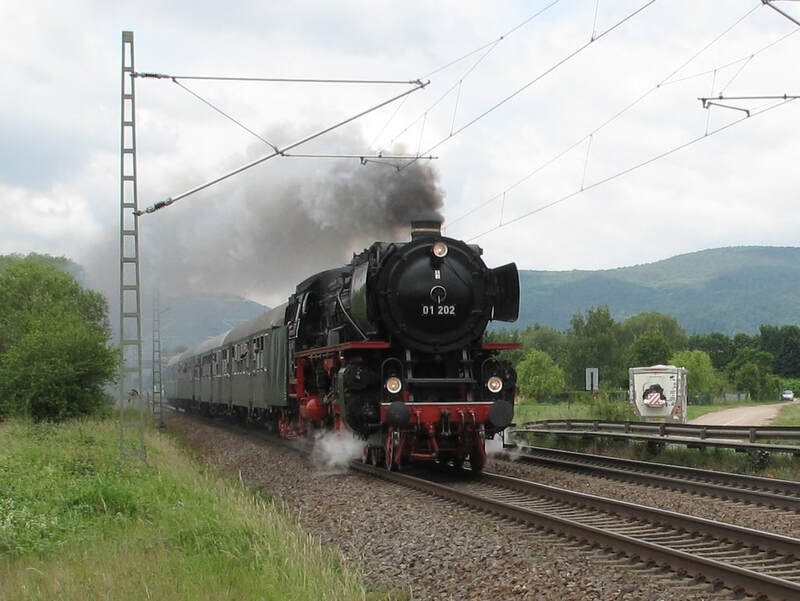 Displaying considerable initiative, he organised a railtour over some freight lines in Bavaria, two of which ended near breweries, together with a visit to one of the breweries. Well, what was not to like? Back I went to Germany to pursue two interests in one go!